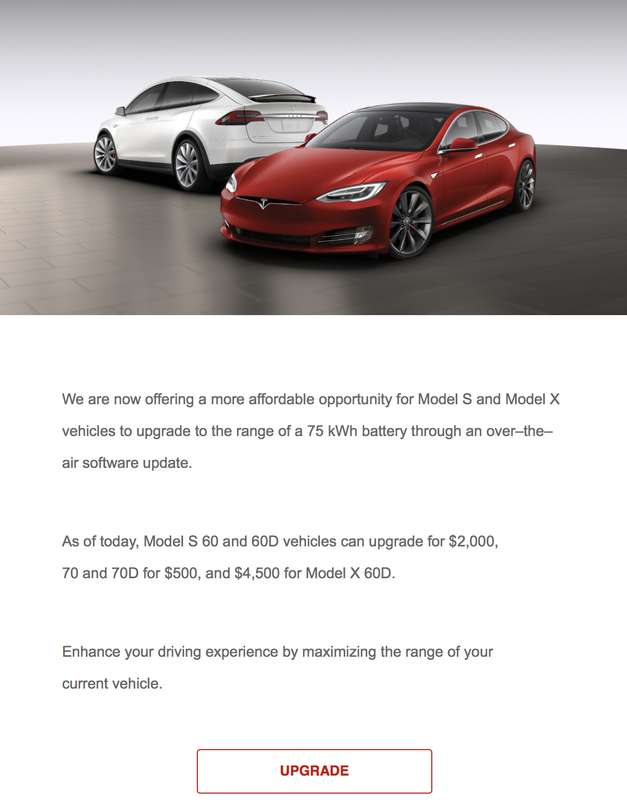 At one point last year, Tesla offered almost $20,000 in software-upgradable options when buying a vehicle and started advertising upgrading to the software-locked features through in-car purchases – pictured above. 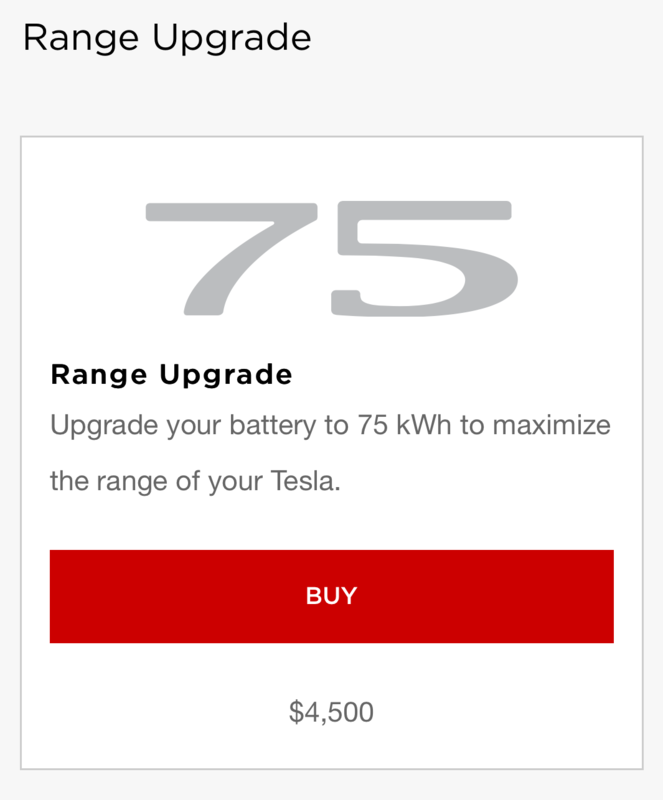 After the recent changes in its vehicle lineup, Tesla has now slashed the prices of the most important software-locked features: the battery capacity upgrades. Last week, Tesla discontinued the base version of the Model S, the Model S 60, which had a 75 kWh battery pack software-locked at 60 kWh, and replaced it with the Model S 75. In the process, Tesla also slashed the cost of unlocking the remaining 15 kWh in the existing Model S 60 out there to only $2,000. Tesla had already discontinued the software-locked 60 kWh option on the Model X in October 2016, but the owners didn’t receive a deal as good as the Model S 60 owners did last week. The price of upgrading their Model X 60D to a 75D through software update went down from $9,000 to $6,500 at the time. Owners can simply go to their “My Tesla” page on the company’s website and order the upgrade. A few minutes later, it will be available. As we discovered through Jason Hughes’s hacking of Tesla’s battery management system, the 75 kWh upgrade is not a “good deal, but the Model S 60 is a bargain.” It’s not good for your battery pack to charge it daily at 100%, but charging a Model S 60 at 100% is not a problem since it’s like charging a Model S 75 at 86%. It also increases your charging speed since you will always have at least a 10 kWh buffer even at a higher state of charge. Therefore, the remaining 15 kWh is only really useful for long-distance travel. At $9,000 and then $6,500, it was difficult to justify for only a few occasions that owners would need it, but now at $2,000 for Model S owners and $4,500 for Model X owners, it’s a tougher decision.